This costume was made for my 5year old grand daughter Bella. 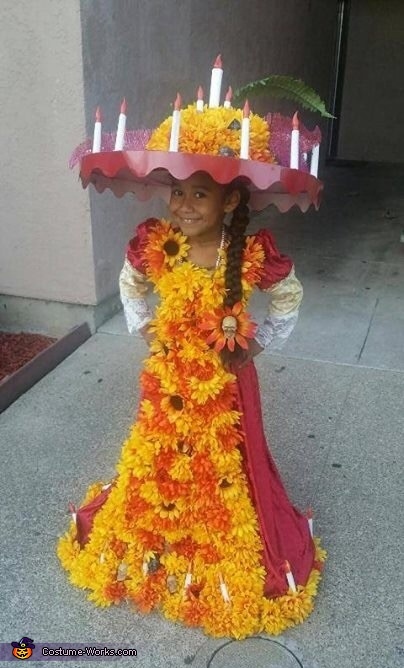 The costume us not sold in stores , and although I deviated from the original book of life design, my idea was to capture "la muente" in her inacence as a child. I pulled together bright looks and tried to make it fun and festive. Aside for time the whole dress was under $100.00 to make. Almost 80 percent is made from recycled /thrift store idea so and leftover products from around the house. I purchased the candles and flowers hew, everything else was pre owned. My grAndughter doesn't like face paint do I needed to incorporate as much of LaMuerte" in her without including her face. I also made head pieces and earrings or my other granddaughter alexia who was just a skeleton girl. I will upload those photos as well.